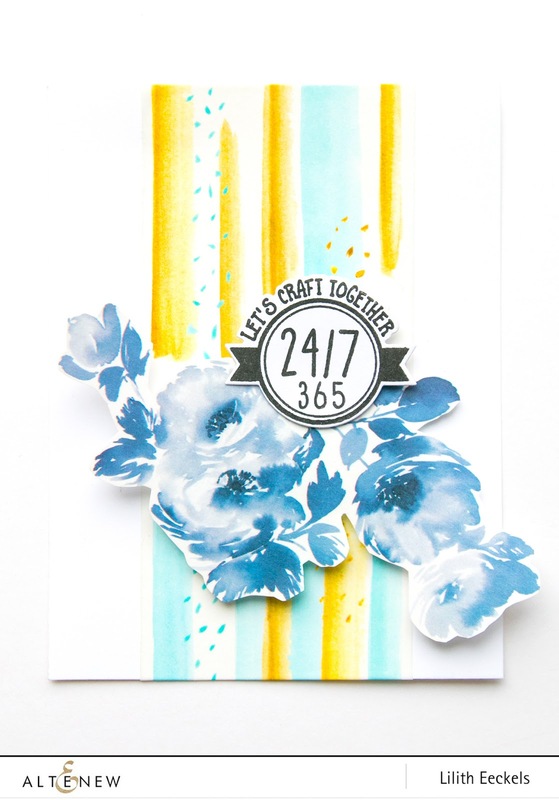 Welcome to our Stencil, Ink and Washi tape release blog hop. If you have come from 's blog you are right on track. I created a couple of projects for this month's release and I also have a GIVEAWAY AT THE END OF MY POST. I was so excited for this month's release because there was one new item which I was dying to get. The large WASHI TAPES. They are amazing and super versatile. I can even see myself using them on a wall. 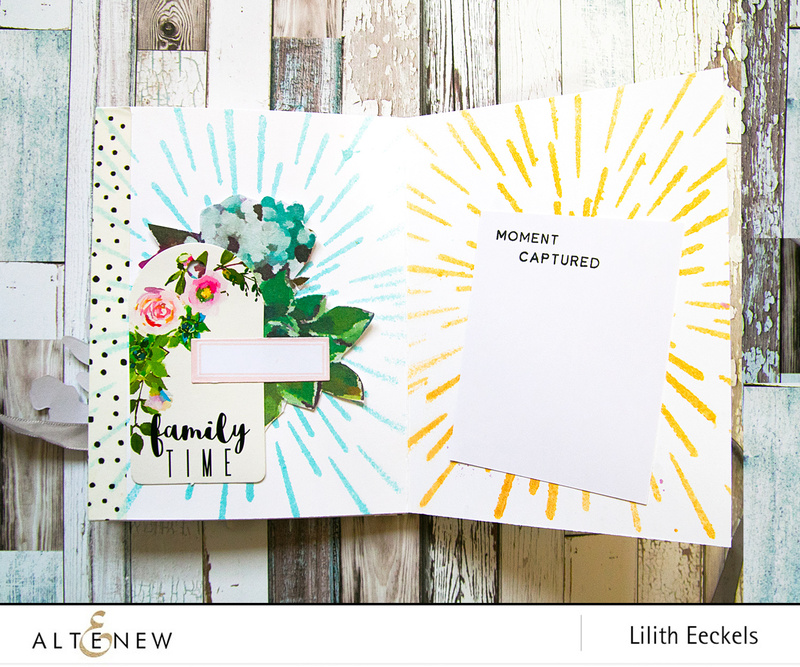 I created a layout and a card using the Monochrome Washi Tape which I adhered onto some white cardstock. Then I cut out several of the flowers. I added two strips of washi tape to a 12 by 12 inch sheet of white cardstock and placed my photo to the right. I created a cluster of flowers using my cut out shapes. For detail and contrast I used some wood veneer shapes from the New Day Card kit. I love how the wood just adds the right amount of contrast. 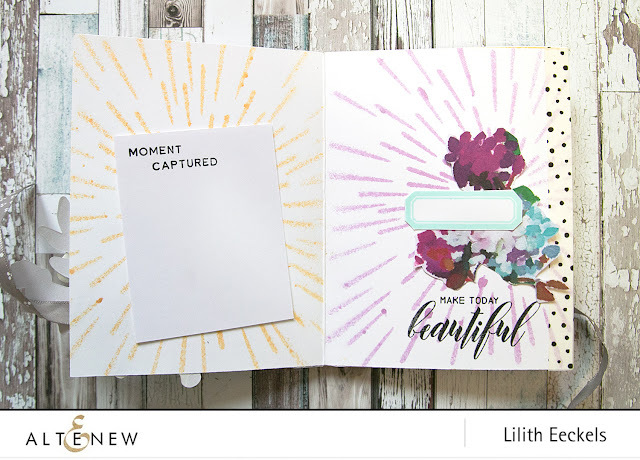 As I had some flowers left over, I created a simple card using the flowers and a strip of Watercolor Strokes Washi Tape. For my sentiment I used the Crafty Life Stamp Set. For my next project I created a mini book using the Warp Stencil, the new Gold Shimmer Spray Ink and a couple of older Spray Inks. I used the Our Family collection to create embellishments. For the title I used a die from the Script Words Die set which I cut out from foam to have some extra dimension. I have to admit that I REALLY LOVE the washi tapes. What is your favourite item from the release? I too am giving away a gift voucher worth 30$. Just leave a comment. I will draw a winner on the 15th. Thank you so much for stopping by and commenting. 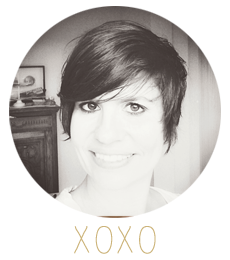 I love reading your comments and discovering which products you like the most. HAPPY SCRAPPING AND HAPPY HOPPING. I, too, love those new washi tapes... I'm seeing so many clever ideas to use them! Lilith ur cards are stunning. Im in love with these washi tapes! Fantastic job! Very pretty layout and card with the large washi tape and I like your projects with the warp stencil too. I am so seriously obsessed with all of the cards that have been created using this washi tape! Stunning! Love the mini book and scrapbook ideas. Cute projects! Cool new release from Altenew! Your scrapbook page is lovely! That Washi tape is so versatile & the stencils are fabulous, as is evidenced in your card. 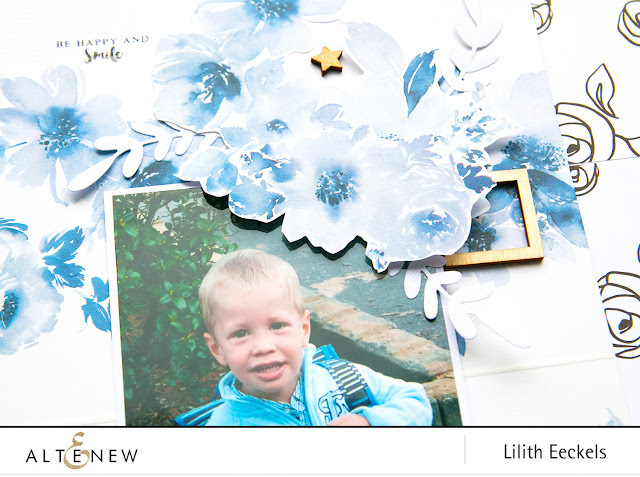 OMG, SO many beautiful projects, love the layout and that adorable little boy, so sweet!! That washi tape one is amazing using the mini book, such talent. Awesome post. Thanks. Beautiful projects!!! The mini book is so sweet and cute!! Stunning layout!! I can't wait to get my order!!! 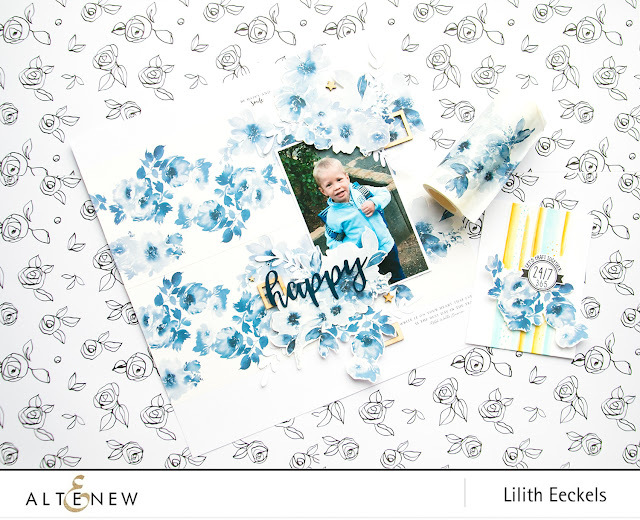 You create such amazing layouts with these products!!! 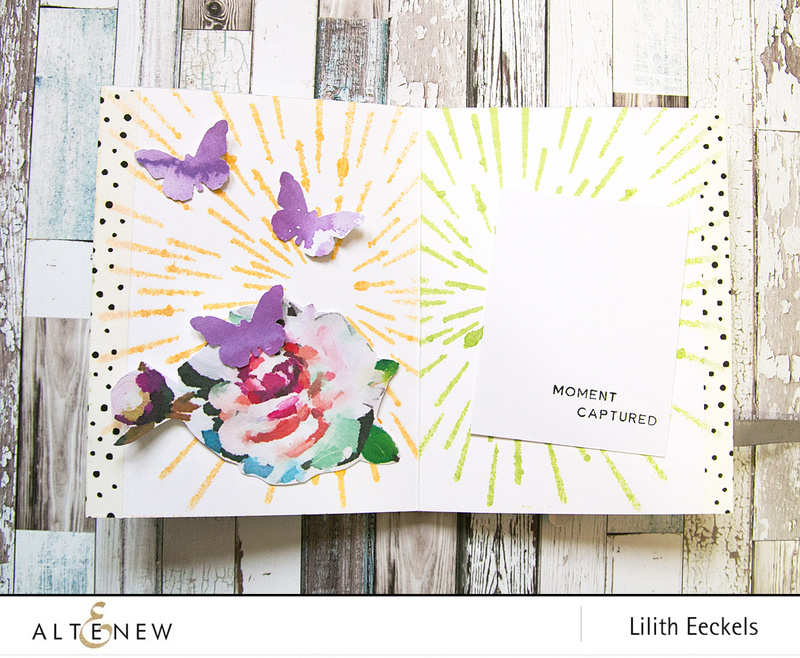 beautiful cards and layouts! love the mini book. tfs! Thanks for the great examples on how to use these products! I definately love that washi tape! Your projects look fantastic! I love that stencil also. Your scrapbook page is a wonderful compliment to the handsome fella on it. And I love your small book pages. 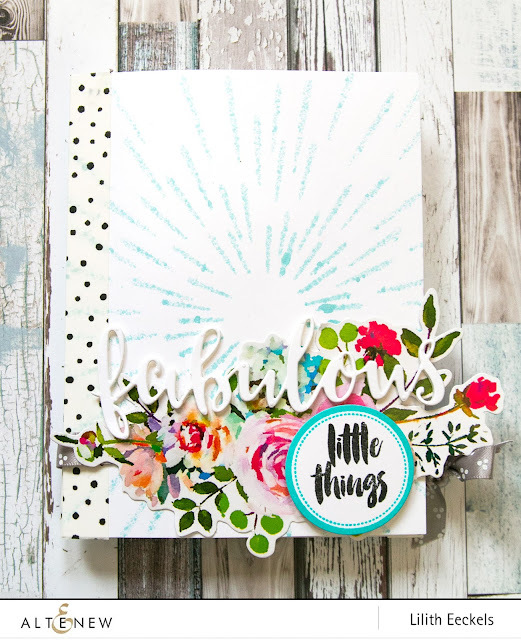 Wow, amazing and beautiful projects, love the cards, scrapbook layout with the gorgeous floral washi tape and journal pages! My favorite from this release is the Leaf burst stencil, followed closely by the washi tapes. I think I just feel in love with washi tape all over again after looking at all your amazing art work! 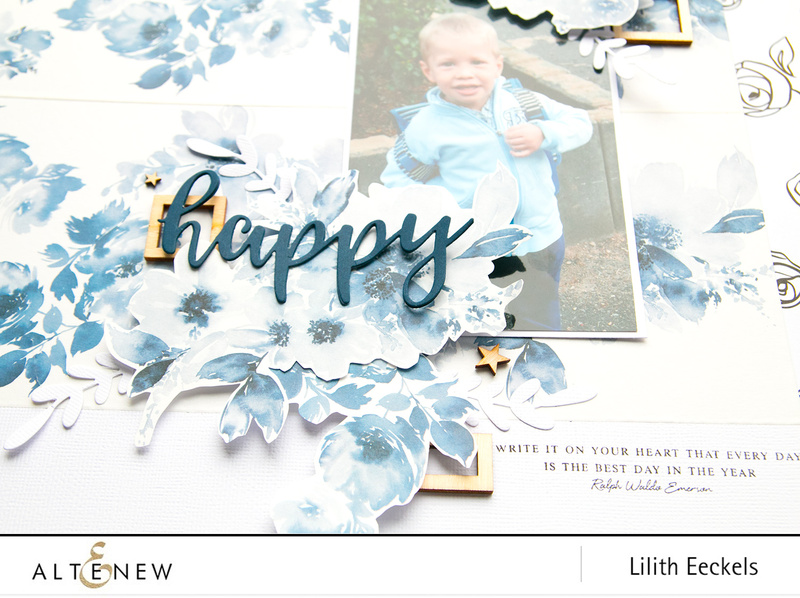 Such a pretty layout and pretty cards - love the new stencils and washi tapes especially the floral flurries tape. Wow, these are all so stunning!! You've showcased the new release so beautifully!! Love these!! Love everything about this release! Can't pick a favorite. Your projects are just beautiful. I really love the washi tapes, too! The stencils also look like fun. Adorable layout and fun book. Beautiful layouts and I’m loving the washi tape. So vibrant and so beautiful! Fun projects! I really love the Warp Stencil! 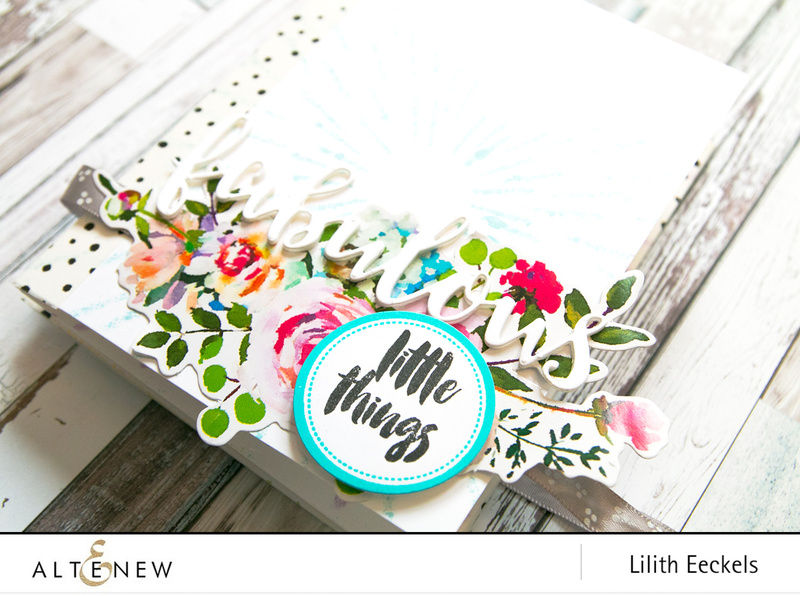 love the scrapbook layout for your cute little guy - beautiful cards with these new washi tapes and stencils! Lovely projects! Like you, I am so excited about the washi tapes! I've never seen washi tape so wide before and they're gorgeous! I not only want to use them in my card making but also in home decor projects. Gorgeous cards!! I love the new Altenew stencils. Fabulous use o this stunning release! i think I'd best order that Washi Tape before it sells out! Beautiful projects! I am loving these stencils and washi tapes! Such an inspirational hop! 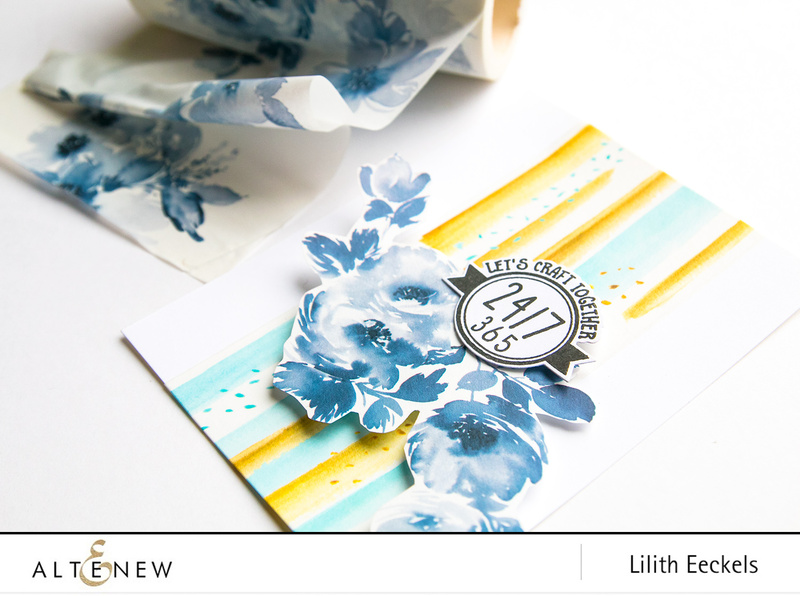 I love the blue floral washi tape and the leaf stencil the most, but really, the entire release is fabulous, isn't it? Lilith, all of your projects are amazing, the mini book is awesome. Well done. Your creations are absolutely beautiful!!! Thank You for highlighting some of the items I have on the way😊, especially that layered stencil you used on your fabulous page😍, can’t wait to get that one❣️❣️❣️ It’s perfect for any project.....and I have quite a bit of blank wall space in my new craft area. What better way is there to fill it up than with Altenew? You are so creative. I am in awe every time I look at your projects! awesome use of awesome products! Love the sentiments, especially Ralph Waldo. You've used everything in so many different ways! Thank you for sharing your inspiring pieces. Love them all! Beautiful use of these products. I love seeing all the ways you all come up with to use them. Thanks! 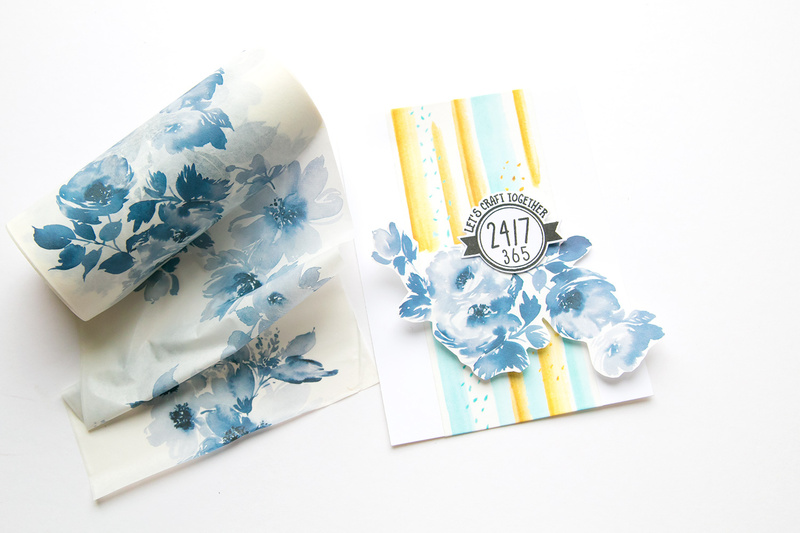 Beautiful blue flowers washi tape! Cute layout! I love the fact that you show us so many new uses for the washi tape! Such fun use of all of the products! Love your use of washi tape. Have not used them often but now I think I will! Love your use of washi tape! Sorry if I commented more than once. Did not see mine. wonderful love the blues and the other pages too. Thanks for sharing. Great use of the washi tapes in particular - you really make them come alive. Beautiful projects. 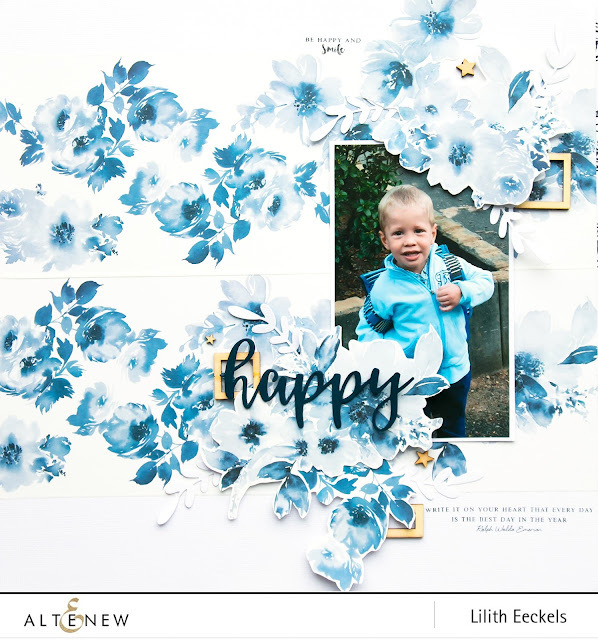 I especially love the layout and design of your scrapbook page. So unique. I truly love what you have created with this new release. It shows all the possibilites and really encourages me to pull out my wallet. Thanks for so much inspiration! I love your scrapbook layout! There are so many great products in this release, I don't know where to start! But I do know they're going on my wish list! 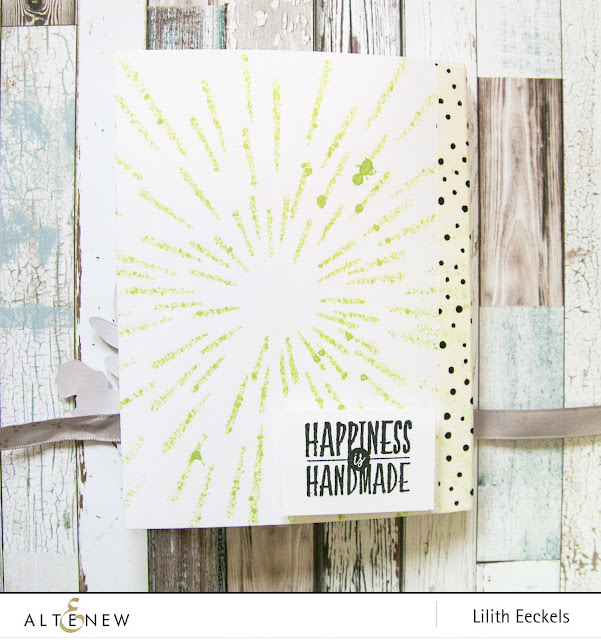 Love your projects using the new washi and stencils. This is such a fantastic release! Thanks for sharing. I love your mini book, and oh my the washi is to the for. Thank you for sharing your talents. 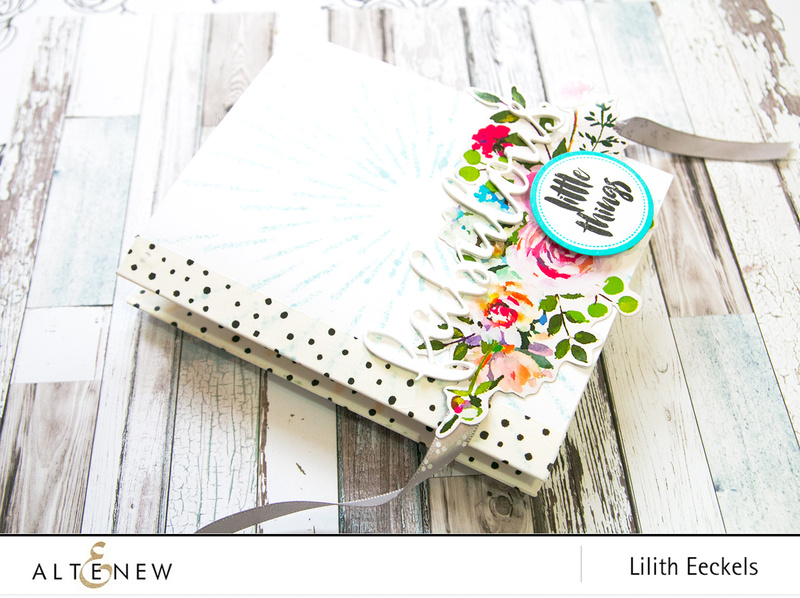 I love how you layered the washi on the layout, great idea!! Wonderful projects! Loving how you used that blue floral washi in both the layout and the card! 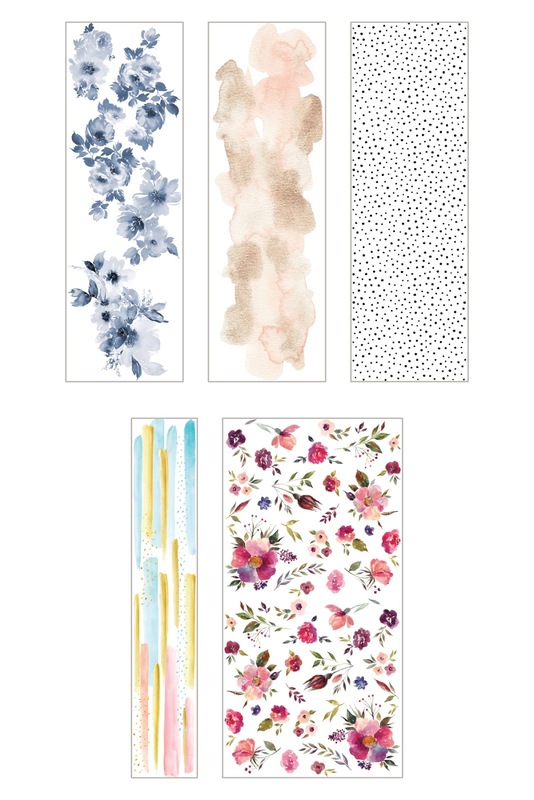 Beautiful, This washi is so versatile! Amazing projects. You are very creative. Thanks for sharing. Wow! Unique use for the beautiful tapes! Love how you used the products in this great release. Love your projects! Very creative! Thanks for the amazing inspiration! I think I am ready to jump onto the washi tape bandwagon now! What a wonderful new line of stencils - so innovative, and love that you can use each one in different ways to achieve multiple effects. The inspiration is amazing! Gorgeous projects! 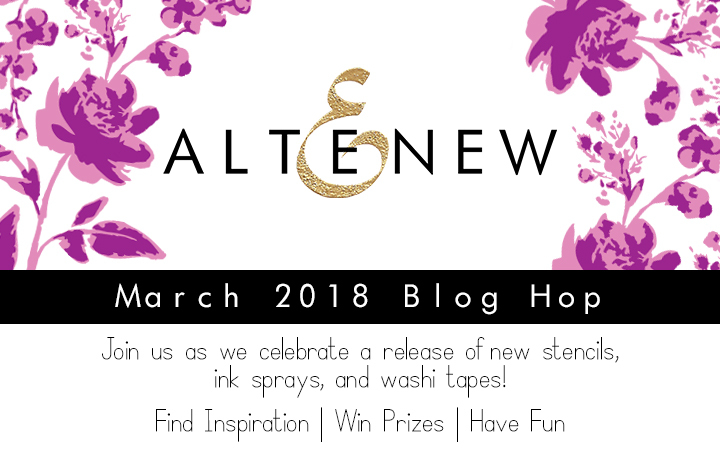 You used all of my favorite new products from Altenew, which is pretty easy as I think they might ALL be my favorite. I am in love with those new Washi tapes too! Lovely projects! Beautiful projects! The layout is so pretty, nice balance of elements without overwhelming the darling photo. As I view all of these stunningly gorgeous samples using the new release products, I keep flipping back and forth between the washi tapes and the stencils; oh and there's the metallic ink sprays! I guess I just want it all! I'm really excited about the stencils, but I love the blue monochrome washi tape. In an ideal world, that's how I could paint. But until then, I'll happily use the washi! I love seeing your scrapbook layout with the tape on the base and as sprays above the picture. It's just lovely. Thank you so much for sharing with us! I too love the various washi tapes, and the stencils, and the sprays. I can't pick just one favorite. Your scrapbook page, card, and mini book are wonderful. Wow so beautiful love the Washi tape! That warp speed stencil is a must have. I love te large washi tapes too, so versatile! Your layout is beautiful and stunning!!! Fun projects. Thanks for sharing them. Beautiful layouts! I love the stencils. So many beautiful uses with inks, watercolors, embossing/texture pastes. Lovely layout and cards. This is a fabulous release. Love all of your beautiful creations! Thanks for sharing your wonderful ideas on using the items from the new release. Love those washi tapes! This month there are so many wonderful products as always, hard to choose! 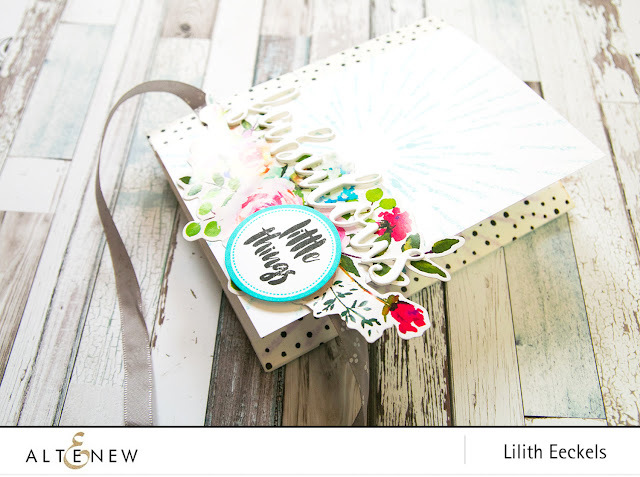 That washi tape is so pretty, I love how you incorporated it on maculine projects, you are an amazing crafter Lilith! Love all your projects! Thanks for the inspiration! Have a wonderful day! Love love your both the projects...mini book is excellent..
Love both ur creations...Mini book is excellent..
You've showcased the new products beautifully in your layout and mini book. Thanks for sharing your creativity.